The 700 Series Wood Pellet Grills from Pit Boss offer the best value per square inch in the pellet grill industry. The 700S features an upgraded cart with locking caster wheels. These 8-in-1 grills have the cooking versatility from smoking to searing (standard flame broiler) with a dynamic range of cooking temperature from 180° to 500°F, and all with the simple turn of a dial. An electric igniter allows for easy, mess free, barbecue lighting. With complete structural strength and durability, these high-value grills are meant to last. 700 sq. in. of cooking space>digital control board>Porcelain-coated cast iron cooking grids>180°-500°F cooking temperature>Locking caster wheels This item cannot ship to APO/FPO addresses. Please accept our apologies. 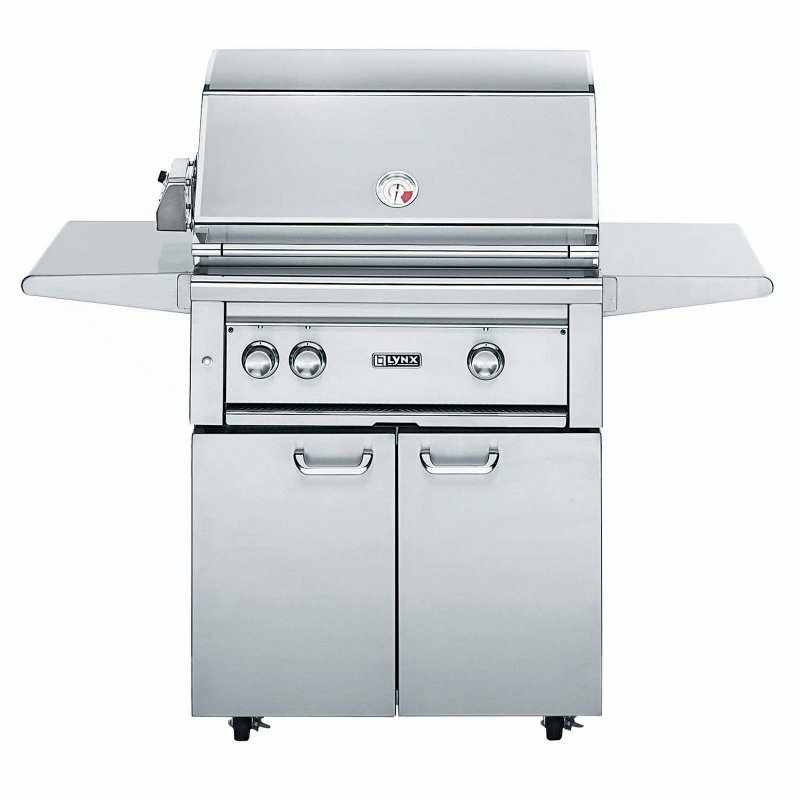 The Lynx L30ASFR-NG is a freestanding natural gas grill that features two Trident Prosear2 variable searing burners used for exacting, restaurant-quality performance creating an all-sear grilling surface, an infrared rotisserie with adjustable speed motor, 800 square inches of total cooking surface and produces a total of 50,000 BTU's. 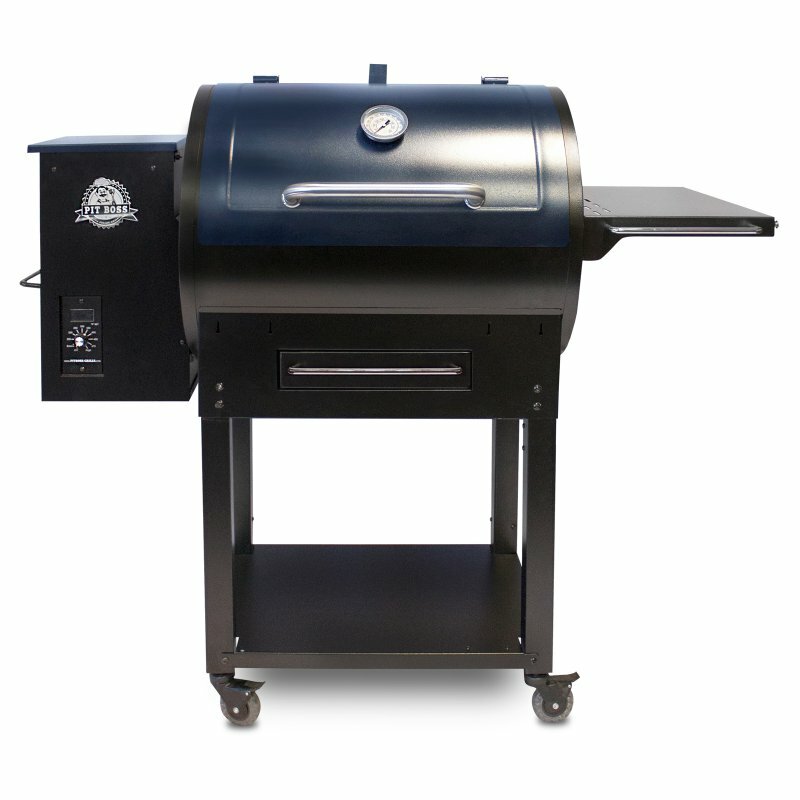 This American made gas grill has additional features such as hood assist hood - making the grill hood lightweight and easy to lift, blue LED accent lights around the grill knobs allowing for the perfect look at night, dual halogen grill lights to illuminate the cooking surface when grilling in the dark and 304 grade stainless steel construction throughout the entire grill. Stainless steel cart features foldable stainless steel side shelves, double access door underneath grill for storage and heavy duty casters for mobility. Lynx began as the vision of a group of people with almost a century of collective experience, who for 35 years were manufacturing top-of-the-line stainless steel products for the commercial food service industry. Lynx has taken that same quality, workmanship, service and innovation and incorporated it into the Lynx Professional Grills line of products. The combination of the best materials, fine craftmanship Trident ProSear2 burners>Rotisserie system w/3-speed motor>smooth welded joints>Blue LED indicator lights>Internal Grill surface light>Easy to read large temperature gauge This item cannot ship to APO/FPO addresses. Please accept our apologies. 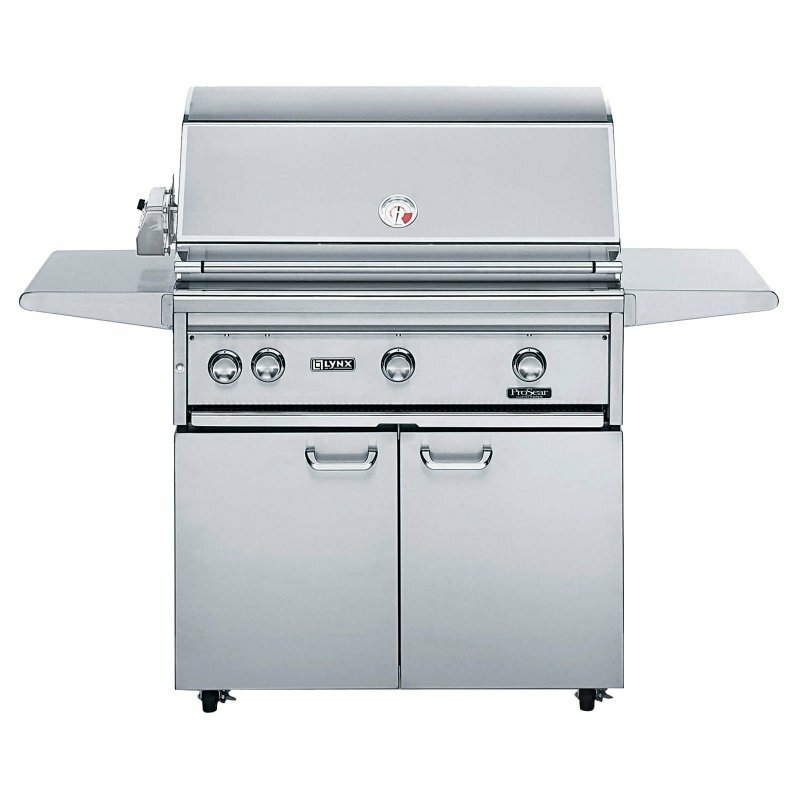 The Lynx L36ASFR-NG is a freestanding natural gas grill that features three Trident Prosear2 variable searing burners used for exacting, restaurant-quality performance creating an all-sear grilling surface, an infrared rotisserie with adjustable speed motor, 800 square inches of total cooking surface and produces a total of 75,000 BTU's. 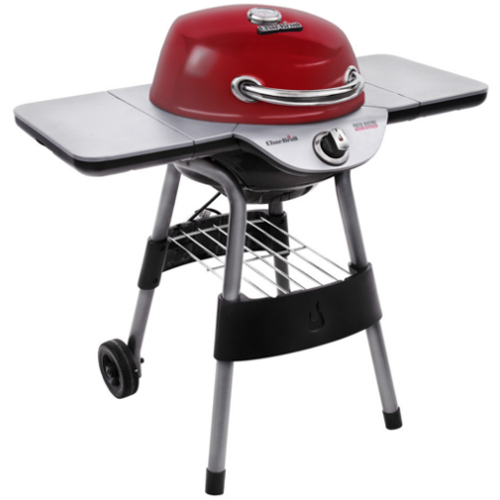 This American made gas grill has additional features such as hood assist hood - making the grill hood lightweight and easy to lift, blue LED accent lights around the grill knobs allowing for the perfect look at night, dual halogen grill lights to illuminate the cooking surface when grilling in the dark and 304 grade stainless steel construction throughout the entire grill. Stainless steel cart features foldable stainless steel side shelves, double access door underneath grill for storage and heavy duty casters for mobility. Lynx began as the vision of a group of people with almost a century of collective experience, who for 35 years were manufacturing top-of-the-line stainless steel products for the commercial food service industry. Lynx has taken that same quality, workmanship, service and innovation and incorporated it into the Lynx Professional Grills line of products. The combination of the best materials, fine craftmansh Trident ProSear2 burners>Rotisserie system w/3-speed motor>smooth welded joints>Blue LED indicator lights>Internal Grill surface light>Easy to read large temperature gauge This item cannot ship to APO/FPO addresses. Please accept our apologies.